One very common question that I get a lot is about how should we allocate with a few very competing financial goals. And I hope today in this short article, I give you some ideas how to work this out. When it adds up, it can be very confusing. Which one to do first? How do you rank one above the other? Now let us break this answer into 2 parts, the Wealth Foundation and Advance Wealth. I have a series on my site called the Wealth Foundation. If you read that, and comprehend most of the stuff written in there, and implement them in your life, you should do fine. The first part of the answer addresses this. In life there can be tangible metric, there can be intangible metric. Intangible metrics are whether you have lead a fulfilling happy life. This is very subjective, so we differ to evaluating the tangible metric. The key tangible metric here is whether we are doing well financially. Whenever someone suggested to you to do something, you got to ask whether it improves you financially today, if not tomorrow. If you repeat doing those 3 steps very well, you will be OK. To dive deeper into the formula, you can read that article. Now let us look at it from another angle. Your take home pay, you either spend it or save it. The spendthrift one will spend a lot. If not enough, the spendthrift one will borrow and take on debt. The prudent one will optimize her spending and save more. Thus, your take home pay you spend it. What is left over is what I would term “The Gap” or your free cash flow, like a listed company. Now in theory, your expenses are mandatory. This means that it is well optimized such that you have good justification why you spend them. This means that if Kyith asks you why you spend on this and that in your expenses, it does not feel guilty. What is left over is the free cash flow. 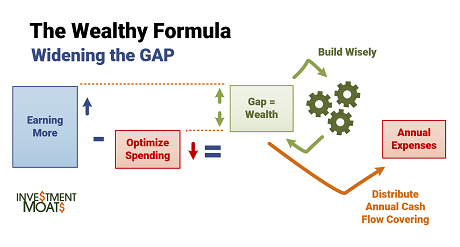 The key success in your wealth foundation is that majority of the decisions that you take in the wealth foundation with your free cash flow will improve your finances. The key metric of measurement is your personal net worth. This is what financially you can be worth. It is made up of your total assets minus your total liabilities. Most of what you decide to do, will improve the net worth. Build an emergency fund. This increases your total assets. Your net worth goes up. Invest in STI ETF. This increases your total assets. Your net worth goes up. But what you want to know is which one gives me the most bang for the buck, or the sequence for which to do first. And I am telling you that is Advance Wealth. In Why You Should Not Force Yourself to Start Investing ASAP, I explain the relationship between funneling more of your free cash flow to building wealth, versus the rate of return you get on average for investing your wealth. 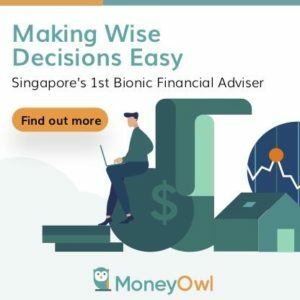 When you deliberate on whether to top up CPF SA first, build an emergency fund first, or pay off your home loan first, what you are doing is optimizing the overall average rate of return you will get. In the table above you see 4 different rate of return from 0% to 9%. Whether you do well or not, your average should be between them. But to build up $300,000 from $0, as the table above, you realize the bigger determinant at the start, is your monthly savings or the amount of free cash flow you have, to build wealth. For example, if you free up $1000/mth and you can invest, save, pay off debt, which result in different rate of return, the time to get to $300,000 is between 13.7 years to 25 years. 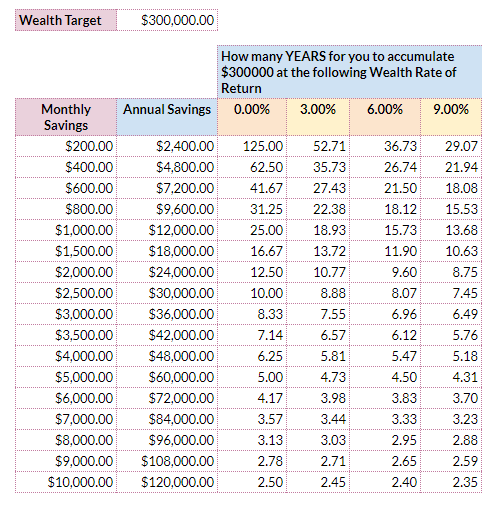 If you bump it up to $1500/mth, the time is shorten to between 10.6 years to 16.7 years. So you get a 3 to 8.3 years improvement. With more free cash flow, or if you increase “The Gap”, the rate of return matters less. So the more important question you should ask Kyith is, have I really optimize my expenses well, and whether I have maximize my earnings potential? Another aspect that I think does act up is that we have different relationship with the financial actions that we need to do. Some of you hate debt and feels anxious if you have more of that. Some of you felt not good if you are not saving money. Some of you are absolutely impatient about money rotting in the bank account and would want to invest it. 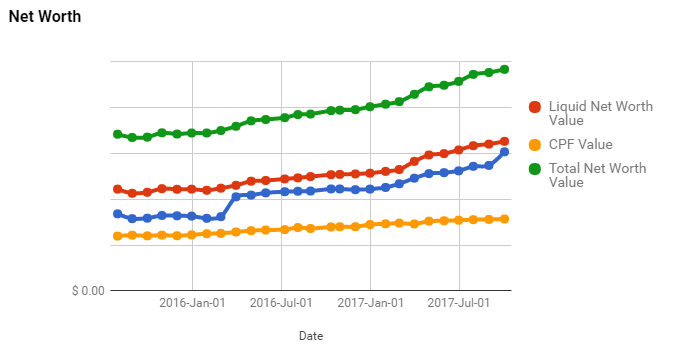 If you wish for things to be less confusing, you track the net worth, or the rate of change in the net worth (read this why you should track it). If you absolutely need to invest, but the right thing to do is to pay off your debt, don’t feel discouraged that you cannot. Just do a monthly tabulation of your assets, debt and work out your net worth. Then plot it like what I did above. Doing well means it is rising. If its not rising as fast as you want, or declining, then we talked about the advance wealth: which financial action should you prioritize. #1 to #3 start off at different state, yet the conclusion is that things will improve for them. #1 is weaker in that she has some baggage, but she should see bigger improvements than #3 because she puts away more into improving her net worth. #2 doesn’t really know what she is doing, but at least she is taking the prudent route. While learning, her net worth is still growing. And you realize, compare #2 to #3, #3 decide to put into recurring plans passively, while #2 deploys her money in an active manner. Both started off not knowing what they are doing, one is more willing to learn. My money is on #2 to do better than #3. This is not because active manage trumps passive. It is basically that #2 seems to take a more conscientious role to managing her money and have more personal free cash flow per month. As a summary, whichever actions you take first, or if you do a mixture of them, would improve your net worth today, if not tomorrow. If I can, let me go into the advance wealth portion next week. 1. Properly sized term & Shield insurance. 2. Emergency funds of 6-12 months expenses. 3. Read & educate on nitty gritties of investing, long-term savings, market history, debt management etc etc. 4. Know yourself; develop a philosophy. 5. Apply & evaluate strategies & tactics. 6. Iterate thru 3-5, it’s an ongoing process. Hi Sinkie, thanks for contributing a good SOP!